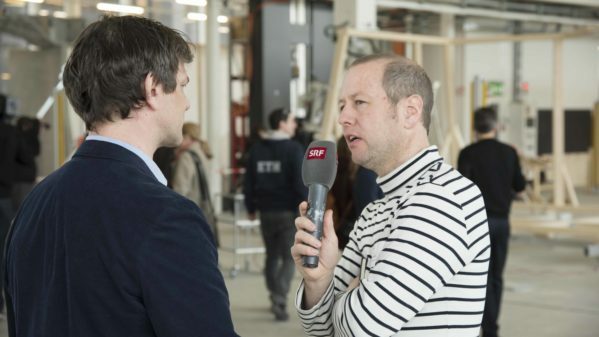 The fabrication of the mesh mould wall in May 2017 was the starting shot for the construction of the DFAB HOUSE and generated an enormous continuing media interest for the project. 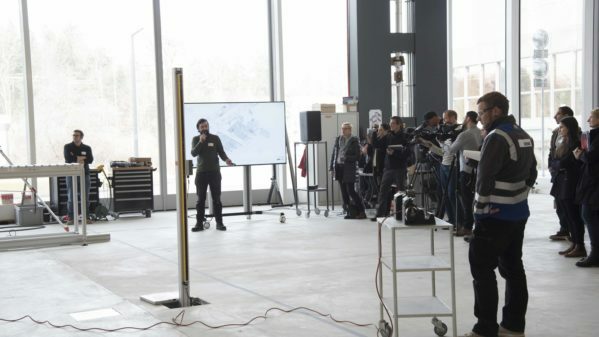 In a second media event, therefore the project team invited journalists to inform about the achievements in the ongoing construction of the DFAB HOUSE. 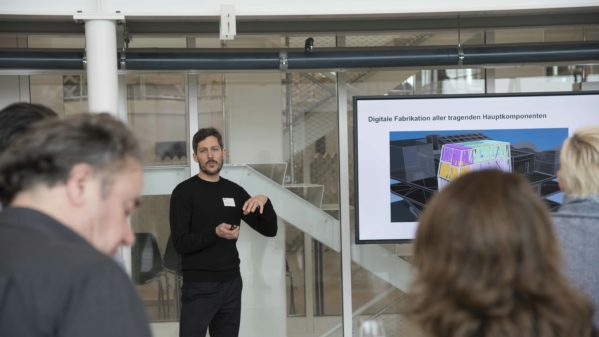 Furthermore, they presented “Spatial Timber Assemblies” – a digital building technology which has been developed under the auspices of the National Centre of Competence in Research (NCCR) Digital Fabrication in collaboration with ERNE AG Holzbau. 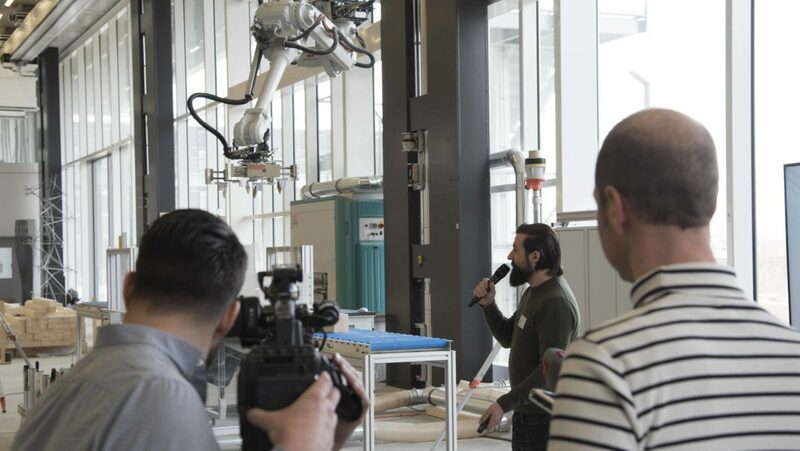 In the subsequent live demonstration in the Robotic Fabrication Laboratory at ETH Zurich, the research team showed to the numerous national and international media representatives, how cooperating robots enable the efficient construction and assembly of geometrically complex timber modules. A total of six spatial, geometrically unique timber modules will be prefabricated with Spatial Timber Assemblies. 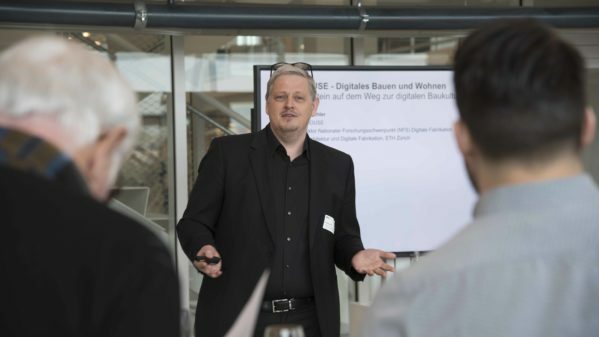 Lorries will then transport them to the DFAB HOUSE construction site at the NEST in Dübendorf, where they will be joined to build a two-storey residential unit with more than 100 m2 of floor space. Unlike traditional timber frame construction, Spatial Timber Assemblies can manage without reinforcement plates because the required rigidity and load-bearing result from the geometric structure. Not only does this save material; it also expands the range of possibilities for traditional timber frame construction. 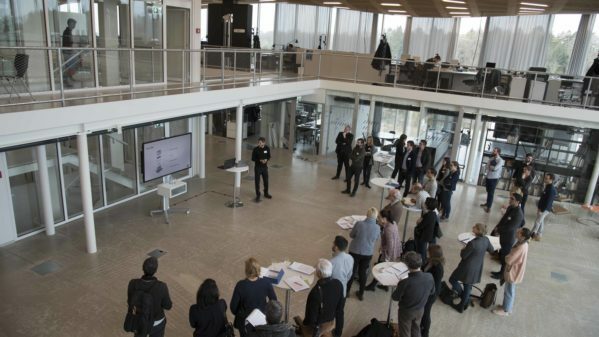 Detailed information about the building process, quotes as well as image and video material can be found in the official media release by ETH Zurich.